As I continue to blog each morning this Lent with a daily reflection drawing on the works and writings of Samuel Johnson, I am also completing a paper marking on the 400th anniversary of the death of William Shakespeare on 23 April 1616. During these few days in Lichfield this week, I am reminded that Shakespeare was rescued from potential oblivion by Samuel Johnson’s masterly biography, and his plays returned to the stage through the single-minded efforts and exertions of David Garrick. 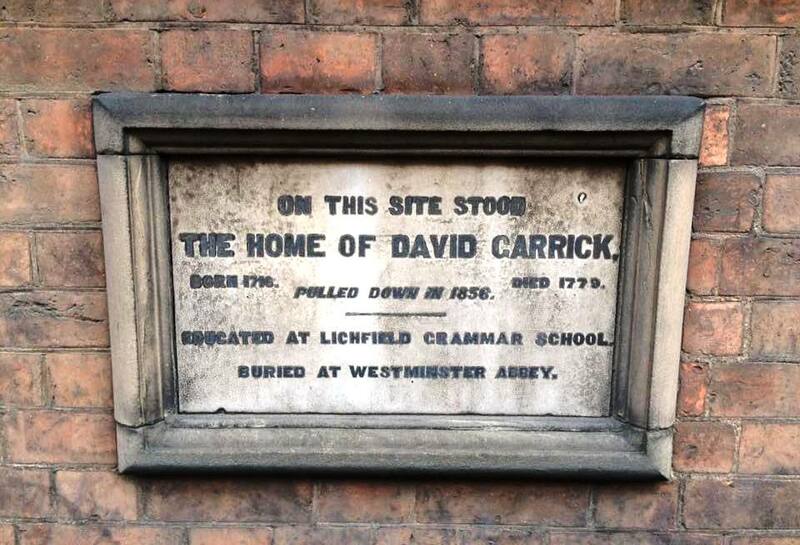 Garrick had once been Johnson’s pupil in his short-lived school at Edial, near Lichfield. 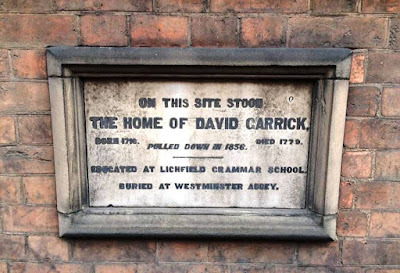 Both are regarded as children of Lichfield, but while Johnson was born within sight of Lichfield Cathedral, David Garrick was born in Hereford. Garrick was born in Hereford almost 300 years ago on 19 February 1717, but within three weeks of his birth his family had moved to in Lichfield where his father was a recruiting officer, and he grew up in the cathedral city, where his mother, Arabella Clough, was the daughter of a Vicar Choral of Lichfield Cathedral. During his father’s long absences on tour, he received letters from ‘Little Davy" telling him of what was happening in Lichfield. 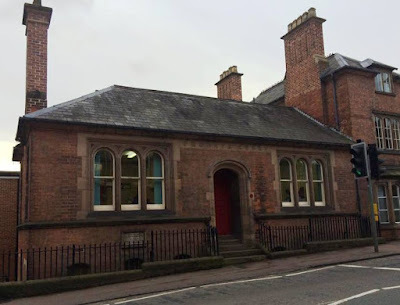 David and his brother George were pupils at Lichfield Grammar School before becoming the first and last students at the school Samuel Johnson set up in Edial. Johnson’s school never a success and closed within six months. Shortly afterwards, Garrick and Dr Johnson made their way, on horse and on foot, to London to seek their fortunes. Johnson was 26 and Garrick was 19. They were both virtually penniless: Johnson later claimed he only had twopence halfpenny in his pocket at the time while Garrick only had three halfpennys in his. When David and George Garrick received £1,000 after the death of an uncle in Lisbon, they went into business as wine merchants, with David working from London and George based in Lichfield. The business was not prosperous and within three years David Garrick had spent half his fortune. He also tried his hand, unsuccessfully, at other professions, and tried to study law. But acting had been his main hobby since his childhood in Lichfield, and on 19 October 1741 he made his debut appearance as Richard III at Goodman’s Fields. His reputation was sealed. With the immediate fame and recognition this performance brought, Garrick contacted his brother the next day, telling him of his desire to leave the wine trade. After much debate, the family reluctantly agreed. And so began a long and successful career in which he played many different roles on stage, mainly in plays by Shakespeare. He was hired by the much-vaunted Drury Lane Theatre the next year, but when the theatre got into serious financial difficulties soon afterwards, he led a strike and sued the management for £600 in unpaid wages. A few years later, after a successful spell in Dublin, Garrick returned to become part-owner of the Drury Lane Theatre with ex-Covent Garden stage manager James Lacey. In 1747, after a short season of acting, Garrick bought the Drury Lane Theatre and began running it. Garrick became the first person to use period-style costumes and props in the theatre. He also pioneered the ideas of refusing backstage entry, reducing fees for those leaving early or arriving late and positioning the orchestra in front of the stage. His difficulties were compounded in the 1770s when he was accused of homosexuality when he had played dandy, effeminate roles, particularly the cross- dressing character John Brute in The Provoked Wife. He stopped playing roles like this and challenged anything that threatened to undermine his prestige and respectability in the theatre. The one true scandal in his life was a youthful dalliance with Margaret Woffington. Garrick had practically ceased acting in 1766. But he continued to manage the Drury Lane Theatre, and in 1769 he organised the first Shakespeare Festival in Stratford-Upon-Avon. This – alongside Johnson’s biography of the Bard – revived a new appreciation of Shakespeare, his plays and his poetry. Of his best supporters on the stage, Mrs Cibber died in 1766 and Mrs (Kitty) Clive retired in 1769. But Garrick contrived to maintain the success of the theatre. In 1776, he sold his share in the Theatre Royal Drury Lane to the Irish writer Richard Brinsley Sheridan. Garrick retired, having produced 24 Shakespeare plays and played at least 17 different Shakespearian characters. But it was a fairly short retirement: the kidney problems that plagued his acting career became worse. He died in London on 20 January1779, leaving his considerable collection of plays and literature to the British Museum. Her magic pencil in her glowing hand. Wide O’er this breathing world, a Garrick came. A School House at King Edward VI School, Lichfield, is named after him, and the Garrick Room is the main function suite in the George Hotel. However, the Garrick family home on Beacon Street, close to the entrance to the Cathedral Close, was pulled down in 1856, and made way for Victorian Probate Court building. The first David Garrick Memorial Theatre in Bore Street, Lichfield, was pulled down in 1953. After four decades as the Lichfield Civic Hall, a second Garrick Theatre opened in July 2003. The first production, The Recruiting Officer, was directed by and starred Corin Redgrave. George Farquhar is said to have written some of the play while staying at the George Hotel in Lichfield, and it was also the first play that David Garrick performed in. I am back in Lichfield these days for a family visit and some family meals, and I am staying in the ‘Saint Chad’ room in the Hedgehog Vintage Inn on Stafford Road, with a view from my window this morning across the city towards the three spires of Lichfield Cathedral. Today [2 March 2016] is the Feast Day of Saint Chad, the patron saint of Lichfield. It was celebrated in Lichfield Cathedral last Sunday [28 February 2016] with the Choral Eucharist, at which the preacher was Bishop Christopher Foster of Portsmouth, Solemn Evensong and Shrine Prayers, and again yesterday with the Solemn First Evensong of Saint Chad. Today, Saint Chad’s day is being celebrated in the cathedral at Morning Prayer (7.30 a.m.), the Eucharist (12.30), and Festal Evensong and Procession (5.30 p.m.), with the installation of prebendaries and the commemoration of benefactors. 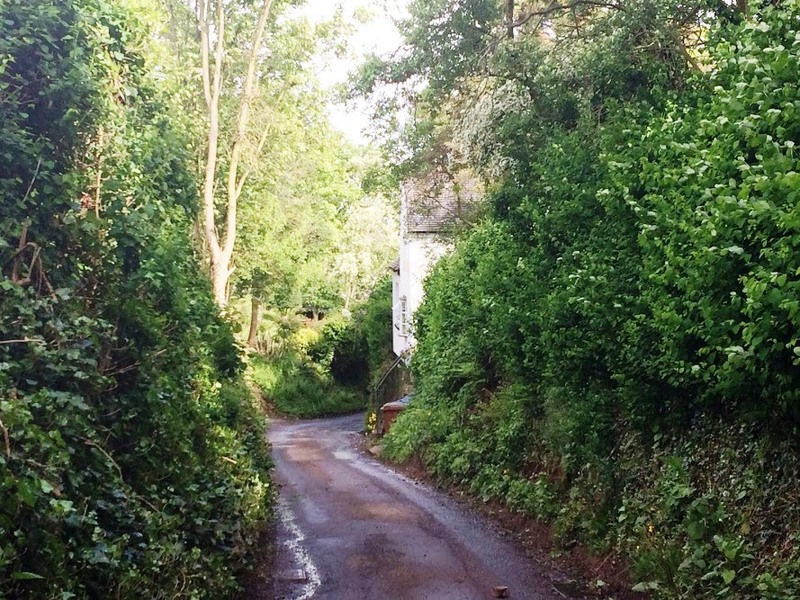 I lately took my friend Boswell and showed him genuine civilised life in an English provincial town. 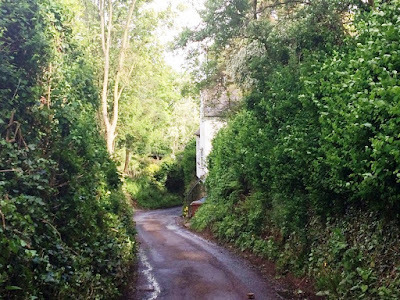 I turned him loose at Lichfield, my native city, that he might see for once real civility: for you know he lives among savages in Scotland, and among rakes in London. During these few days, I am walking the same streets and paths and lanes that Johnson knew as a child growing up in this city. But none of these is as dreary to tread as the paths that Johnson describes in the poem I am reading this morning. Both Walter Scott and TS Eliot considered ‘The Vanity of Human Wishes’ to be Johnson’s greatest poem. Samuel Beckett was a devoted admirer of Johnson and at one point filled three notebooks with material for a play about him, which he named Human Wishes after Johnson’s poem. However, Beckett abandoned the play after he completed the First Act. Johnson wrote ‘The Vanity of Human Wishes: The Tenth Satire of Juvenal Imitated’ in 1749 while he was completing A Dictionary of the English Language. It was the first published work to include Johnson’s name on the title page. As the subtitle suggests, this poem is an imitation of ‘Satire X’ by the Latin poet Juvenal. The poem focuses on human futility and humanity’s quest after greatness like Juvenal, but Johnson concludes that Christian values are important to living properly.